What Product Should You Use for a Chapped Face? Whether it's the result of dry, windy weather, allergies or harsh skincare products, chapped skin on your face isn't just unsightly -- it can be extremely uncomfortable, too. You can usually recognize chapped skin by its red, dry, inflamed appearance, which means you need to treat your face with extra care. Opt for gentle, non-irritating products that can help restore moisture and reduce redness and inflammation, so you don't wind up aggravating skin that's already tender. Even when your skin is chapped, you need to keep it clean. The key is choosing a cleanser that won’t further irritate your skin. Facial cleansers that contain soap can be extremely drying and strip your skin of natural oils that keep it hydrated and smooth. Choose a gentle, soap-free, fragrance-free cleanser to prevent irritation. An oil-based cleanser is often a good option for the face when your skin is chapped. Use warm water to rinse, because hot water can dry and irritate your skin. The key to soothing a chapped face is to restore moisture to the skin. Petroleum jelly can be helpful, because the mineral oils and waxes in it form a barrier to help seal in moisture. However, because it is a heavy, thick product that doesn’t absorb easily into the skin, apply it in the evening. After washing your face at night, apply a thin layer of the petroleum jelly over irritated areas to lock in the moisture. Avoid petroleum jelly if you have acne-prone skin, because it can clog the pores and cause breakouts. Coconut oil is a lighter alternative to petroleum jelly. It's semi-solid at room temperature, so it has a thick consistency. As a result, it doesn’t just moisturize chapped skin, it acts as a barrier to keep it hydrated longer. Like petroleum jelly, however, coconut oil doesn’t absorb easily into the skin. It's not suited for use during the day, when you may be applying makeup or other treatment products over it. Use it at night after washing your face. Warm up the oil between your fingers to soften it and make it easier to apply to your face. During the day, treat your chapped face with pure aloe vera gel to help soothe irritation. 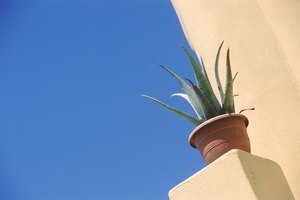 Taken from the leaves of the aloe plant, the gel can help restore moisture to the skin and reduce inflammation. Buy bottled aloe vera gel at the drugstore or use fresh gel from the plant. It has a cooling effect on the skin, which may ease discomfort. Apply the aloe gel to your face in the morning after washing. Add a layer of heavier moisturizer over it if your skin needs additional hydration.